Casa Pata Salada in Sayulita, formerly known as the Casitas at Casa Carolina. Escape to Sayulita, a quaint, yet bustling tropical fishing village 40 miles north of the Puerto Vallarta Airport! Beautiful beaches, world-class surfing, relaxing jungle walks, and simple village life awaits you. Local restaurants offer fresh fish caught that day, as well as authentic regional food. Casa Pata Salada consists of nine lovely and unique guesthouses, each with a full-size kitchen, bedroom, bath, large private patio, breathtaking view of the ocean, and direct access to the beach. Please note unit prices vary. For current pricing for each individual unit, please view the Pricing Tab. Casita #8, coming soon is a large, ocean view studio, with one King bed, one Queen sofa bed, bathroom and full kitchen. This unit will accommodate 4 guests. Casita #9, coming soon, is a large, ocean view studio, with one King bed, one Queen bed/Loft, one Queen sofa bed, bathroom and full kitchen. This unit will accommodate 4 guests. The Village Square, grocery stores, and restaurants are only a five-minute walk away. Each Casita is completely self-contained with its own private entrance. Perfect for a romantic couple or a couple with a child. Casa Patas Salada artfully decorated with Mexican tile, rustic furniture, antiques, as well as charming arts and crafts collected from throughout Mexico. They are incredibly spacious and each has a panoramic view of the ocean. Daily maid service is provided. (Sundays and Mexican Holidays excluded) The rest is up to you. 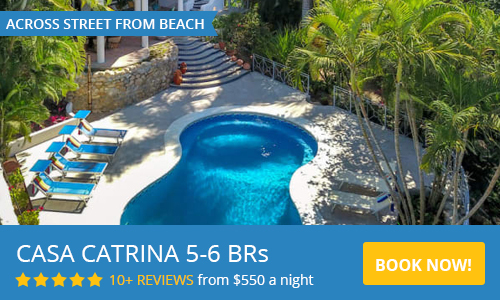 Accommodations- Each Casita has a complete, full-sized kitchen, private bathroom, large and spacious bedroom, and private patio with two lounge chairs with a spectacular ocean view. 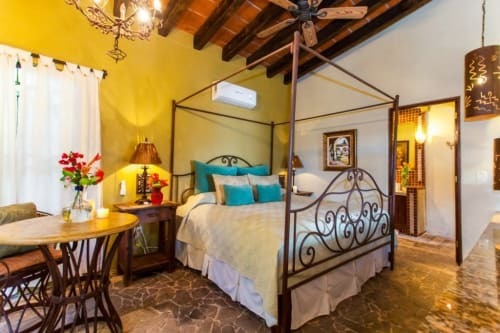 Our Casitas are beautifully decorated with a fresh Mexican decor and every casita has a pillowtop mattress, High thread count sheets, separate bath and beach towels, purified water, kitchen necessities, satellite t.v. and wireless internet. Air-conditioning is available during the summer months. There is direct beach access and we are only a 5-minute walk to the center of the village. 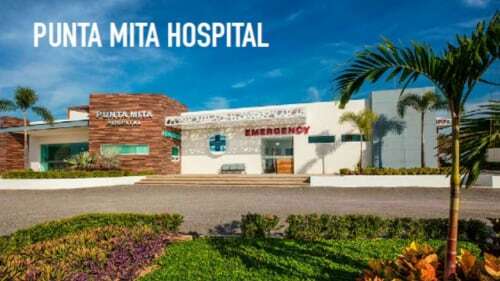 Casitas #1,3,4,7,8 and 9 all sleep up to 4 guests with one king size bed and one queen size pull out couch (casita #3 has 2 queen size beds) & (casita #9 has 1 King, 1 Queen and 1 pull out couch)All other casitas (#2,5,6) sleep 2 guests with the option to add a third guest on a cot for an extra $35 USD per night. Please use the contact for for any questions and to request a reservation. We look foward to welcoming you to Casa Pata Salada in Sayulita! We stayed at Casa Primavera and it was perfect! Comfortable beds and good showers, very efficient and clean kitchen, and a patio with marina view we found hard to leave. People watching from the pool and patio could be addictive! We were treated like family and will definitely be back. We stayed in Casita #1. It was breathtaking. The owners make it so easy to jump right in and begin relaxing. We arranged for a taxi pickup through Casa Pata Salada and he was there waiting for us in Puerto Vallarta holding up a name sign. We highly recommend doing this as you are literally swarmed by transportation companies trying to solicit you. We stopped at the Mega store on the way to Sayulita to get our starting provisions. In hindsight this was not really necessary as everything you need can be found in town. Be sure you bring your e-mail with you giving you the code to the room and the wi-fi password. For some reason, I did not have this on hand but we fortunately ran into the owner, Gabe, when we arrived and he let us into the upper gate. Everyone associated with this place is so nice and helpful.The Casita is fully stocked with bathroom essentials (soap, shampoo, conditioner). The kitchen has everything: fridge, stove, microwave, toaster, coffee maker, paper towels, dish soap. We hurried and unpacked, had a cold glass of wine and set off to town to explore and get the lay of the land.The town was much more crowded than what I was expecting but charming never-the-less. We ended up renting a golf cart from Gabe, the owner, as he has a place in town called Pacific Golf Carts. That was a great investment as the town is very hilly and my husband and I would have found that a bit challenging. It was super f un cruising around in our little cart. In the evening, we would park it on the upper level of the resort and plug it in to charge it for the next day's adventure. There is an upper road to the resort as well as a lower road to the resort and depending on where your casita is, that's how you enter. Any questions or problems we had were immediately taken care of by the great office staff, Brooke or Roxy, as well Ana, our maid. The place is meticulously cared for.My favorite part of the day was relaxing by the heated infinity pool. I honestly had the pool mostly to myself during the majority of our stay. You can lay in the pool and stare out at the people walking along the beach, the boats coming and going, and the surfers riding the waves.So far, my favorite place in Mexico. Wake up to a panarama of the ocean and hear the waves crash to shore. We will definitely be back.We stayed in Casita #1. It was breathtaking. The owners make it so easy to jump right in and begin relaxing.We arranged for a taxi pickup through the Casa Pata Salada and he was there waiting for us in Puerto Vallarta holding up a name sign. We highly recommend doing this as you are literally swarmed by transportation companies trying to solicit you. We stopped at the Mega store on the way to Sayulita to get our starting provisions. In hindsight, this was not really necessary as everything you need can be found in town.Be sure you bring your e-mail with you giving you the code to the room and the wi-fi password. For some reason, I did not have this on hand but we fortunately ran into the owner, Gabe, when we arrived and he let us into the upper gate. Everyone associated with this place is so nice and helpful.The Casita is fully stocked with bathroom essentials (soap, shampoo, conditioner). The kitchen has everything: fridge, stove, microwave, toaster, coffee maker, paper towels, dish soap. We hurried and unpacked, had a cold glass of wine and set off to town to explore and get the lay of the land.The town was much more crowded than what I was expecting but charming never-the-less. We ended up renting a golf cart from Gabe, the owner, as he has a place in town called Pacific Golf Carts. That was a great investment as the town is very hilly and my husband and I would have found that a bit challenging. It was super fun cruising around in our little cart. In the evening, we would park it on the upper level of the resort and plug it in to charge it for the next day's adventure. There is an upper road to the resort as well as a lower road to the resort and depending on where your casita is, that's how you enter.Any questions or problems we had were immediately taken care of by the great office staff, Brooke or Roxy, as well Ana, our maid. The place is meticulously cared for.My favorite part of the day was relaxing by the heated infinity pool. I honestly had the pool mostly to myself during the majority of our stay. You can lay in the pool and stare out at the people walking along the beack, the boats coming and going, and the surfers riding the waves.So far, my favorite place in Mexico. Great location, all the amenities you'll need, neat decor, close to town & beach. Kitchens were well appointed, beds were comfy, bottled water dispenser in each room, felt very safe. All around awesome experience. -Stairs are STEEP! Be prepared to get in shape for the trek up in and out of the Casa. -We don't recommend swimming in the ocean due to the water quality.. Head north to San Pancho for that. Casa#5 was just perfect for us! We were only able to be in town for one night and these hosts were very accommodating. The stairs were a little daunting since the road below was not usable, through no fault of the owners. Very clean, with all necessary accessories. Great shower. Beautiful casita. So close to everything! Our stay at Casa Pata Salada was fabulous. This casita is right on the beach though located just outside the main beach area so you're not with all the crowds and noise. Perfect location just outside of town so it's easy to walk back and forth as needed. The grounds and casitas are well maintained and fully stocked with all items needed for cooking. The onsite pool wasn't heated for the first part of our stay due to a propane shortage. However, they did turn the heat on the last few days of our stay.The reservation process could be a little more streamlined. The owners requested half of the payment in cash upon arrival vs. taking a credit card. I discussed this with them in advance and was able to pay the remaining amount via credit card prior to our arrival.Overall, great experience. We only stayed at Casa Pata for one night but loved it! Beautiful property, helpful staff, friendly cats. Our Casita did not have a view, but it was still very nice. Soft comfy beds, full kitchen, private patio. The pool on the ocean was a treat and we are already planning another visit for longer. Great location, was super clean. Great view and close to the beach. Great internet, kitchenette, and mattresses. Within a couple minute walk to the main area downtown. We loved this place and will definitely return when we visit Sayulita again. Gran lugar. La ubicación es perfecta para tener acceso a la playa y al pueblo a la vez. Nosotros fuimos con nuestros perros y nos la pasamos super bien. El personal siempre estuvo al pendiente por si necesitabamos ayuda. The rates are fair and firmly priced in USD. To hold and confirm your reservation, we require 50% paid upon your booking, balance is due in cash on arrival. For your conveneince, we accept cash, Credit Cards, and Paypal. Small Casitas can accommodate two people, there is a king bed and a cot for a third guest that may be added for an additional $35 USD night. ALL PRICING IS PLUS 16% IVA SALES TAX & 3% STATE BED TAX, THE RATES BELOW INCLUDE TAX!